Great question. Great camp and an amazing sacred space. This was not lost on us and lies heavy on our hearts. However, we have been faced with the stark reality that we can truly only afford to run one camp, and in fact, last year the Ohio Conference was on the verge of shutting down the Outdoor Ministries program. We have been working to find solutions to protect our camping program and keep the doors open for one of the camps. We felt that we had to make a choice to back one of the camps to ensure that one would remain open. WRA/EOA Association Minister Rev. Rita Root put together a vision plan for our associations last year that included the need for a retreat center. In speaking with her and looking at our own objectives and goals, we realized that we could work collaboratively with the WRA & EOA Associations to accomplish what we were both setting out to do. We love Templed Hills also, but we could not find a way to make keeping that site feasible considering its current state. We felt we needed to concentrate on keeping Pilgrim Hills and the outdoor ministries alive, and to focus all of our efforts and resources in one place. Maybe the decision to only have one physical site should have been made long ago, but our conference predecessors were not able to make the decision, and unfortunately, it brought us to the position that we are in today. We believe that Pilgrim Hills with it’s size, the number of year round facilities, the potential for new facilities, and the current dilapidated state of Templed Hills – makes the choice clear. We understand why our Conference leadership moved everything to one site, we were hemorrhaging money at that time and the Conference leadership wanted to see what it would look like to have all of our operations out of one site. A drastic decision needed to be made. Now it’s time to complete that move and focus on one site, remodeling and upgrading that site, developing and caring for that site and working together to have one outstanding outdoor ministries site. Who is part of Affirm Camp? Simply, we are a small grassroots advocacy group who cares about outdoor ministries in Ohio and the development and future of Pilgrim Hills. Currently, there are four of us who are actively working on this project; Robin Stanley, Seth Vaill, Rev. Rob Patton, and myself. We continue to seek ways to ensure that this valuable ministry will be available for our children and our children’s children into the future. If you would like to be a part of our team, please contact nate@avonlakeucc.org for more information. I signed the initial Affirm Camp petition, but I don’t agree with the decision to pursue saving Pilgrim Hills and not Templed Hills. What should I do? We recognize that there is a number of you out there that are strong Templed Hills supporters and care deeply for that site. We have ties to Templed Hills as well. 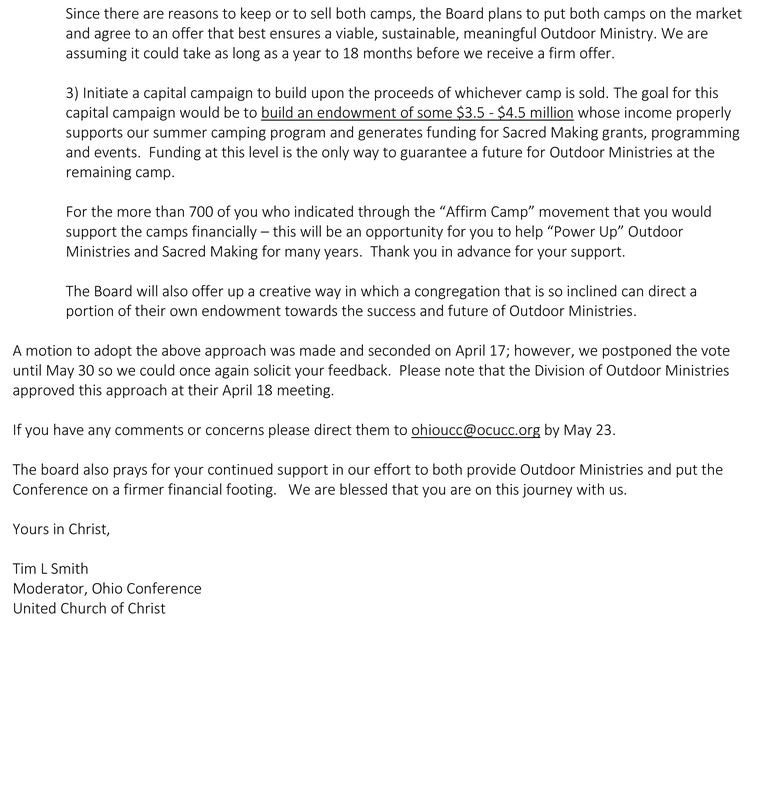 The petition we initially circulated in March of 2015 was an effort to showcase to our Conference leadership that there was still immense support for Outdoor Ministries in Ohio. We were able to make that point very clearly thanks to all of you who support Pilgrim Hills and Templed Hills. We believe that most people agree that the only way forward for our outdoor ministries is to divest ourselves from one of our physical sites that we currently own. So we have shifted our focus to work to preserve the Pilgrim Hills site exclusively. We encourage those of you that are longtime Templed Hills supporters to please consider the reality of the situation and join in our efforts collaboratively to preserve Pilgrim Hills. We believe that over time we can find ways to make Pilgrim Hills sacred space for all of us, not matter what camp we have known and loved. There may be other missions for which Templed Hills can be used, but we felt at this time our resources, time, and efforts, needed to be focused on the place that had the most potential and where our summer camping programs, retreats, and activities were currently being held. As of today we have raised the $8,550 to contract with Kaleidoscope Inc. to do a feasibility study of Pilgrim Hills and provide us with a comprehensive business plan for the possibility of the EOA & WRA Associations acquiring this site. We are continuing to explore this as a possibility to ensure that we can continue to offer summer camping, retreats, and sacred spaces to the entire Ohio conference. Due to the instability of the Ohio Conference, we felt that we needed to explore all avenues to ensure the continuation of this ministry. In February our Affirm Camp team will present this proposal to the EOA & WRA Councils for their approval. If they vote to move forward, the team from Kaleidoscope will begin their work. In the meantime, it is our understanding that our Conference Minister has a team of individuals working as a Camp Sales Group to do the work to get both of the sites listed for sale. I received an update from Conference Minister, Rev. Phil Hart on Monday, January 11th that read in part “As for an update from the camp sales group. We have spent a pretty significant amount of time reviewing the laws and zoning for the different partials of land and since they are in several different counties and townships that has taken us a while. We needed to know things like square footage requirements for septic systems and things like that. Currently, the prices that were listed on the appraisal are being reviewed and we are determining the listing price for each partial and part of the land. I am waiting on that report but hoping it will come to me soon.” The reality is that these sites could be listed any day and begin to receive offers. We have asked the Kaleidoscope team to expedite their work due to the unknown amount of time we have to work with. Once they complete their work, our Association Councils will review their report and make decisions on how to move forward from that point. First and foremost, go to camp. Schedule a retreat, take your family there for the weekend, and sign up to go to summer camp 2016. The more use of the facility only helps the overall case for Outdoor Ministries in Ohio. For more information on how to schedule a retreat or sign up for camp, please visit http://www.journeythehills.org. Secondly, encourage your local church to support the Affirm Camp work and the work of outdoor ministries. Consider a fundraiser or a donation to the Outdoor Ministries campership fund or to the Affirm Camp work. Thirdly and most importantly, please continue to pray for our leaders and for our outdoor ministries and for the future of this vital, life-changing ministry. Do you have additional questions? Please comment below or email them directly to nate@avonlakeucc.org and we will answer them as soon as we possibly can. Hey Everyone! Long time. No posts. We agree. Several months ago, we launched the Affirm Camp movement in hopes of gathering signatures and letters of support for Outdoor Ministries in the Ohio Conference. Your response directly affected the decisions made by the Conference Board of Directors at their meeting in April. The result of that meeting was a compromise to place both Templed Hill and Pilgrim Hills on the market, sell one site, and the Ohio Conference would retain the camp that did not sell and continue to offer retreats and summer programming at the site that did not sell. We considered this a victory as the alternative proposal was to sell BOTH sites. Over the past several months, we have continued to come back to the belief that Pilgrim Hills is better site for us to retain as we go forward. We also realized that leaving this to chance on the open market prevented us from being able really move forward with a strategic plan and fundraising effort. This summer, we met with the EOA & WRA Association Minister, Rev. Rita Root, to discuss the possibility of the EOA and WRA Associations leasing/buying/renting Pilgrim Hills and offering retreats and camps through the Associations. 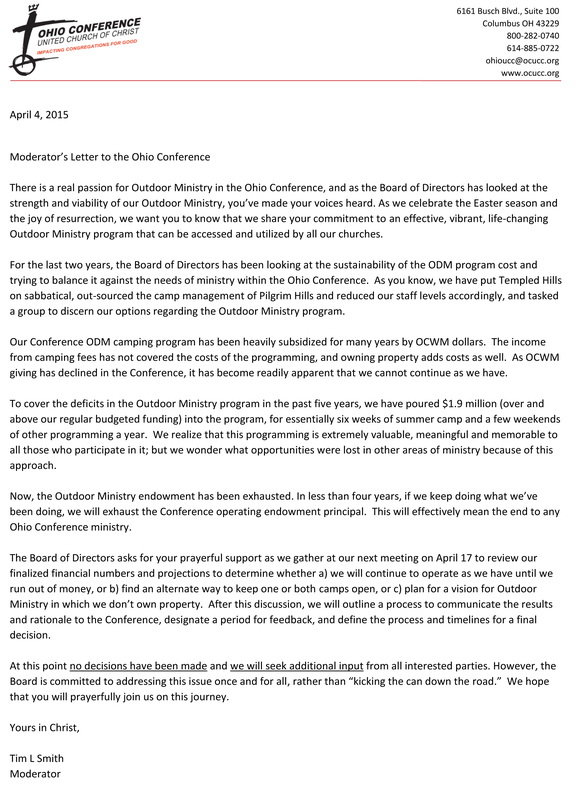 Particularly, we did not see any indication that the Ohio Conference would be placing a staff person in charge of Outdoor Ministries and their expectation was to continue to run Outdoor Ministries through volunteers only. We feel that our kids and our camping program deserves more than that. The discussion with Rev. Root resulted in her challenging us to put together a business plan that she could present to the Association councils in which our associations would rent/purchase/lease Pilgrim Hills for its own use. We got right into and quickly found that this was beyond our time restraints and our professional capabilities. In November, I had the opportunity to attend the Outdoor Ministries Association of the U.C.C. Consult at Pilgrim Pines Camp in Yucaipa, California. I had the opportunity to pick the brain of several incredible people who are camp professionals and absolutely eat, sleep and breathe this stuff. It was there that I was introduced to the Kaleidoscope Inc. and Jody Oates. Jody’s company is based out of Columbus, OH, and for the past 30 years they have been in the business of camp consulting. Then the light bulb went off and I said what if we contract Jody to put together the business plan. Wha-la! So after a few phone conversations and a lunch meeting, Jody drafted up a proposal to do exactly that along with providing us a feasibility report on running a summer camp and retreat program at Pilgrim Hills. The bill for this is $8,550. Avon Lake U.C.C. Has already generously pledged $3000 towards this effort. We are now turning to our churches and individuals who love Pilgrim Hills and love our camping program to ask for their support. If you are interested in helping us reach this goal please see below for more information. I want to be clear that hiring Kaleidoscope is no way an indication of any decision being made by the Conference about any of our camps or an indication of the EOA & WRA Associations making any decisions. We are simply hiring this consulting company to paint a picture for us. There are certainly many questions around all of this that you will have. I am happy to answer any and all of them in the comments or feel free to contact me at nate@avonlakeucc.org. Let us be clear about something else – we are first and foremost supporters of Outdoor Ministries as a beneficial, life-changing piece of all of our faith formations. We are not attempting to take over the current outdoor ministries program. We do believe that it deserves full time staff members, a budget that is supported by our OCWM dollars, and that Pilgrim Hills is a sacred space that should be preserved. We want to pursue all avenues to assist in finding a viable solution to the situation that Outdoor Ministries now finds itself and to assist in alleviating some of the instability within the Ohio Conference itself. We understand that the Ohio Conference has put together a committee to determine how to put the camps up for sale and that committee was to make a report to the Conference Board of Directors meeting in December. However, a report was not made at that time. 1 Forward this message on to anyone else you know who loves our camps in the Ohio Conference. 2 Say a prayer for this effort and for the future of summer camps everywhere. 3 Sign-up yourself or sign-up to your children to attend summer camp this year at Pilgrim Hills. Visit www.journeythehills.org for more information. 4 Volunteer to be a counselor or help out in a variety of ways this summer at Pilgrim Hills. Visit www.journeythehills.org for more information. 5 Encourage your church to have a Camp Sunday and talk up the camp experience to everyone in your congregation. 6 Hold your next church retreat at Pilgrim Hills. The U.C.C. National news team has wrote a story regarding our Affirm Camp movement and the Outdoor Ministries situation in Ohio. I would like to extend my gratitude to them for covering our movement and taking the time to talk to me about the situation and their willingness to run this story. Our voices are being heard. Yesterday afternoon our Conference Moderator, emailed me directly to thank me and the group from Affirm Camp for attending the Board of Directors meeting on Friday and presenting our proposal about the future of our camps. In his email he outlined the contents of the letter that went out to the Conference yesterday as well, regarding the recommendations that the Board has made regarding our camps going forward. I have posted this letter below. Selling one of our campsites is something I fully support and is a decision that should have been made 25 years ago. If we had a site in Cincinnati and a site in Cleveland – it would be a different story, but we have two sites 30 minutes apart. It’s a difficult, painful and decision that none of us wants to make….but a decision that we need to make. One thing I hope and expect to happen is that any money from the sale of one of our sites, should go directly to paying off our Cornerstone Loan and directly towards the remaining site and it’s operation, capital improvements, endowment, etc. I agree that we need to do a capital campaign. We haven’t done one in over 25 years as best as we could all remember at the meeting on Friday. My concern is that a capital campaign for camp is one thing, and a capital campaign for Sacred Making is another thing. They should be separate and completely different campaigns. The people who want to invest in the future of our Outdoor Ministries may not want to support Sacred Making. It’s kind of like adding pork to a bill in congress. The bill supports one major initiative but tucked deep into the bill is $219,000 to teach college students how to watch television or $144,000 to see if pigeons follow human economic laws or $100,000 to study how to avoid falling spacecraft. *actual real pork barrel spending. A capital campaign to support our Outdoor Ministries MUST be done on its own and focused on only one thing. Sacred Making could be a great addition to the Ohio Conference, but it must be funded on its own. There are many on the Board of Directors that fully, completely support the Outdoor Ministries and they were very passionate at the meeting on Friday about their support for the camps. That was extremely encouraging to hear. We still have room to grow in this area. At the same time there are those who believe that place is not important any longer. I strongly disagree with that notion. Place is an incredible part of our faith story and place is vitally important for our Outdoor Ministries. Anyone who has ever gone to camp, PH or TH, will understand the idea of place being an integral part of the entire experience. Now is the time to voice your support for Outdoor Ministries and our camps and send your thoughts about our plan going forward to the Board of Directors and Conference Minister Rev. Phil Hart. The Board will meet again at the end of May to vote on these recommendations. Let’s continue to be heard and heard clearly! There is a LONG way to go in all of this, but I still firmly believe that Outdoor Ministries has a long future ahead of it in the Ohio Conference and whatever site we end up with can be the absolute best conference, camp and retreat center in the entire state. Thank-you for continuing to support Affirm Camp. Your feedback and thoughts and prayers are greatly appreciated. Yesterday myself, Rob Patton & Robin Stanley attended the Ohio Conference Board of Directors meeting at Dublin U.C.C. We were granted an hour at the start of the meeting to discuss the proposal we put forward to the Board and answer any questions they may have. One the thing several members of the Board of Directors made clear was that they truly do care about Outdoor Ministries and one thing we made clear as the Affirm Camp representatives was that we wanted to help the situation and work with the Board of Directors to sustain a viable Outdoor Ministries program for generations to come. We stayed and listened to a presentation from Conference Treasurer, Rev. Sam Beuhrer and then we left when the Board adjourned for lunch. Not votes on our proposal were taken while we were there and no decisions regarding the future of our camps was made while we were there. The conversation and discussion was promising and my hope is that the Board will take action to ensure we have an Outdoor Ministries physical location and a vibrant program for many generations to come. If you have any questions, please let me know! One of the things we pushed for was action – some sort of action. I emphasized that we have been talking about all of this for way to long and we need to make tough decisions whatever they may be. We hope to hear more from the rest of the Board meeting next week. Keep our camps in your prayers and keep encouraging kids to sign up for summer camp! Thank-you for all the support so far for Affirm Camp. I can tell you without a doubt that it has made a significant difference already. Wayne Chasney – former Ohio Conference Moderator and Sr. Pastor at Monroeville U.C.C. A handful of others were invited to attend, but were unable to join us. I am confident that we have a solid group of people to present a case for camp and a path forward that will ensure camping in the Ohio Conference for generations to come. I will keep you all posted on how the meeting goes on Friday. Please keep our camps, our Outdoor Ministries and the leadership of the Ohio Conference U.C.C. In your prayers. In the meantime, we need to continue to encourage others to sign the petition, write their stories, sign-up for camp, retweet and share our posts and keep camp in the conversation. Thank-you all for all of your support! We need to continue to flood the inboxes of our Conference Minister and Board of Directors with support for our camps and your stories of how camp has changed your lives.